I’m one of 5 girls and 2 boys, but that trend seems to have been reversed in the next generation as I so far have 5 nephews and only one niece, who I was 9000 miles away from when she was a baby. So when one of my closest friends had a baby girl, my plans to make burp cloths from some Makower jungle animals fabric went out the window when I realised I finally could make tiny dresses! 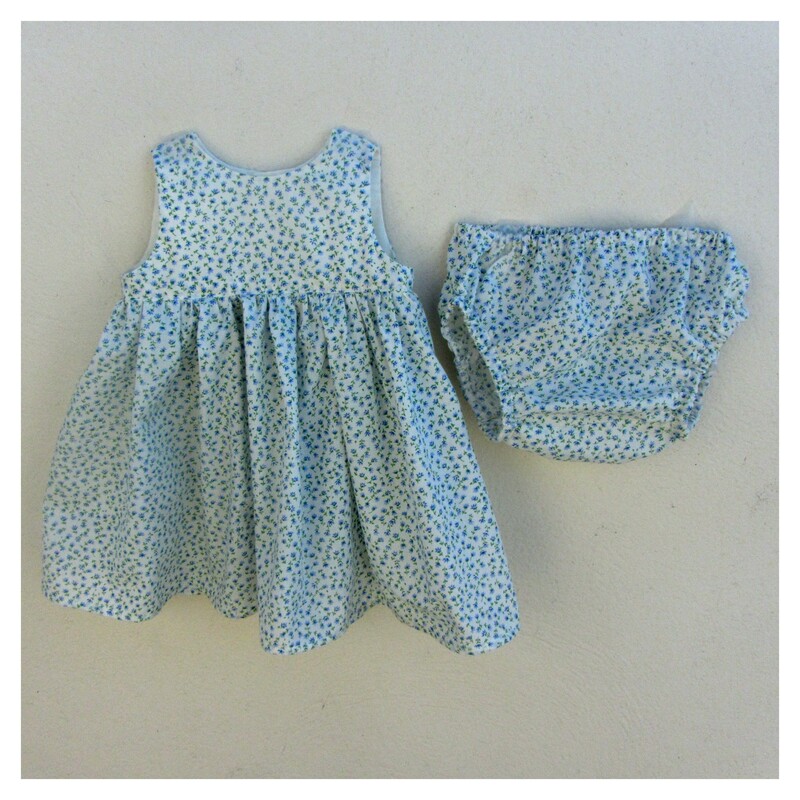 I settled on the free Little Geranium dress by Made By Rae and Perfect Diaper Cover by Dana Made It, with some mini blue and white floral cotton from Trago Mills. To be honest, it was a bit of a mission choosing fabric, trying to take into account my taste, my friend’s taste, my friend’s husband’s taste and suitability of colours and patterns for a tiny baby, but at least I’m happy with it! I followed the directions for the dress despite my normal construction method for a lined bodice being different, and next time I’ll go back to my old way as I just find it easier. My skirt gathering was a little crap as I stupidly didn’t mark half and quarter points to line up with the bodice. I used sew in poppers instead of button holes as apparently they are easier to un/fasten than buttons. Overall, it wasn’t as fast to sew as I thought it would be, but this was down to the fiddliness of sewing something so small when I’m more used to sewing for at least an age 5. It’s a great basic pattern with big potential for variations, and is also available in larger sizes (0-5 and 6-12years) for $10 each size group. The instructions for the nappy cover are equally easy to follow, but this time I did ignore them for the leg binding. I did try it Dana’s way with folding the fabric in on itself to make a tube for the elastic, but I couldn’t get over how unpretty all the wrinkles were. Instead I made some bias binding, sewed it to the wrong side and folded it all over to the front. I actually prefer the look of this as then the inside only has a row of stitches and no ridge of fabric that could rub the skin. I french seamed the side and crotch seams. I’m not sure how what size little I is now, but her birth weight was about average, so I used the amount of elastic given in the instructions.